This past weekend we hosted a small bourbon tasting with a group of friends at our house. Taylor and I have wanted to get more into and understand the different flavors of bourbon for some time, so this was a great way to sample several nice selections without having to stock our own liquor cabinet to the gills. We prepared several small dishes to pair with the bourbons. First up we had Blistered Shishito Peppers, which have a slight amount of char just like the inside of the bourbon oak barrels. Following the peppers was Smoky Baba Ganoush with carrots and olive bread and sweet, slightly spiced Caramelized Onion Crostini. For a more hearty course, we enjoyed Miniature Mushroom Wellingtons (recipe forthcoming). Last but not least, we had Roasted Peaches with Vanilla Honey Whipped Cream (recipe forthcoming also) for dessert. 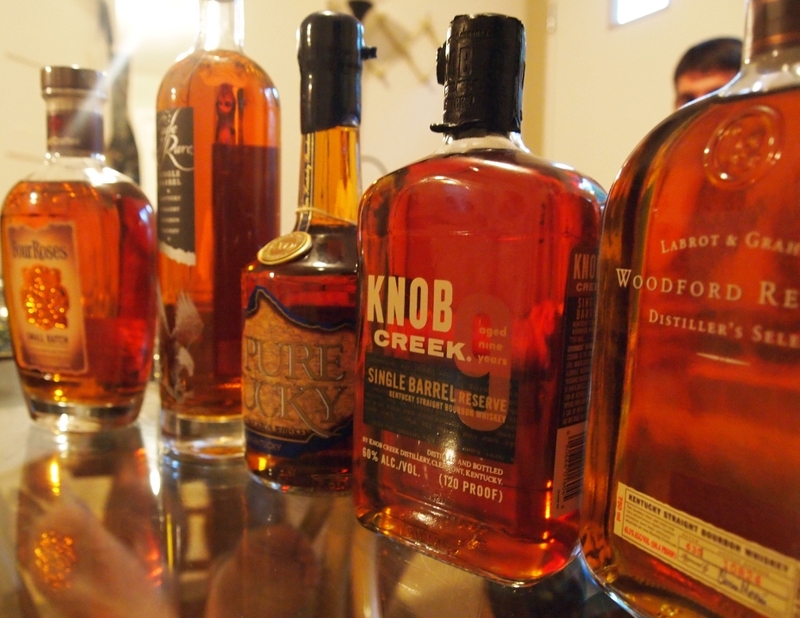 As for the bourbons, we sampled Baker’s, Cyrus Noble, Evan Williams 1783, Eagle Rare, Four Roses, Knob Creek 9, Pure Kentucky, and Woodford Reserve. The flavors of this variety of bourbons ranged from aggressive spice to smooth, silky honey. We can definitely say that not a single bourbon was was unappreciated. I personally liked the smoothness of Eagle Rare the best (my own selection for the evening), while Taylor really enjoyed the spiciness of Knob Creek 9.